As a new mom, I’ve accepted the fact that my lunch will probably consist of whatever I can grab from the fridge and eat with one hand, and I now consider the day a success when I squeeze in a shower. It’s easy to forget to take care of ourselves while caring for our little ones. And our backs are often the first victims of this self-neglect. Days spent lifting and carrying that ever-growing bundle of joy can lead to spasms and aches and shooting pains. One of the biggest culprits is breastfeeding. A typical newborn eats 12 times a day, leaving Mom to spend much of her time hunched over with a rounded back and tense shoulders. This poor posture can lead to serious back pain. Instead of leaning over the baby, use a firm pillow on your lap to raise baby up to the level of the breast, allowing you to sit upright with your shoulders relaxed. Though you can certainly use pillows you already own, a specialty nursing pillow may be easier and more comfortable. The Leachco Ease Back Pillow comes with a back-support cushion in addition to the lap pillow for baby. Moms who pump instead still don’t get much of a reprieve. I’ve found myself in awkward contortions trying to hold the pump flanges with one arm, while checking my phone with the other. The price of trying to multitask? A sore neck, apparently. A hands-free pumping bra lets you focus on proper posture (while sending an email or two). I was put off at first, not wanting to feel like a dairy cow hooked up to a milking machine, but the convenience won me over in the end.The Simple Wishes pumping bra and the Medela Easy Expression Bra are popular models. Or check out this tutorial to make your own with just two elastic ponytail holders. New moms (and dads) also spend a lot of time bent over baby’s crib and changing table. Wall-mounted changing tables like the Nathi changing station from byBo design let you position the table at a comfortable height: aim for slightly below your elbows. This model also has storage to keep diapers and wipes within arm’s reach to prevent unnecessary twisting. Bath time is another back-wrenching activity. While your little one is small enough, bathe her in the kitchen sink to save you from bending over the tub. We love the Blooming Bath—its flower petals form a soft cushion that fits into most sinks. The plush material is gentle for the baby, while standing upright is gentle on your back. Before my son was born, I had no idea how much stuff babies require just to take a trip to the grocery store or a picnic in the park. Now I lug around a shoulder bag weighed down with diapers and wipes, extra clothes, bottles, and snacks. Between carrying the baby and all his gear, my back is screaming for mercy. Obviously, you can try to carry just the essentials, but you might also consider a stroller organizer. These small pouches attach to the stroller handles and offer handy storage. The Skiphop Grab & Go organizer has insulated drink pockets and a port for your headphonesin case you want take a call hands-free. The kids might prefer the sweet animal designs on the strollerorganizers from 3 Sprouts. When buying a stroller, choose a model with a large storage compartment underneath, where you can stash any extra gear. Also, be sure to choose a stroller that is lightweight, easy to fold, and has adjustable handle height (particularly if you are tall) so that you can push the stroller without hunching over. The Aria stroller from the Italian company Peg Perego weighs less than 13 pounds and can be folded with one hand. It also stands upright when folded so that you don’t have to bend over to pick it up. Maclaren also offers a collection of lightweight strollers, including the Volo, which, at 8.8 pounds, is one of the lightest strollers sold today. For younger babies still using infant car seats, the “snap and go” strollers are much less bulky and heavy than the popular travel systems. I liked the Graco SnugRider Elite for its simple design, one-handed folding mechanism and large storage basket. 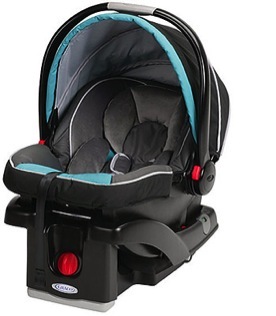 It also works with the 7.5-pound Graco SnugRide Click Connect car seat, the lightest on the market. While 7.5 pounds doesn’t sound that heavy, let’s not forget to factor in the weight of the baby (18 pounds by 6 months, in my case). Lugging around the baby in his car seat quickly becomes a back pain nightmare. Whatever you do, don’t carry the car seat in the crook of your elbow like a handbag. If you must carry it, hold the car seat with both arms to distribute the weight evenly, and keep it close to your body. Personally, this is not a position I can hold for very long, so if I need to carry the baby for anything more than a few minutes, I use a baby carrier. You’ll want to pick a carrier with wide, padded shoulder straps and a padded waist strap that distributes the baby’s weight between your hips and shoulders, such as the BabyBjorn Miracle or the Ergobaby carrier. Once your baby has strong neck control, carry him or her on your back, rather than up front. Some baby carriers offer a side-carrying position, where the baby sits on your hip – though be aware the American Academy of Orthopaedic Surgeons recommends against carrying your baby this way, as it can overload your back muscles. For more back-friendly tips for new moms, check out these suggestions from AAOS and visit this how-to instructional video.